Shocking footage has emerged of the terrifying moment two people stood in a tiny dinghy while a six metre great white shark charged them. 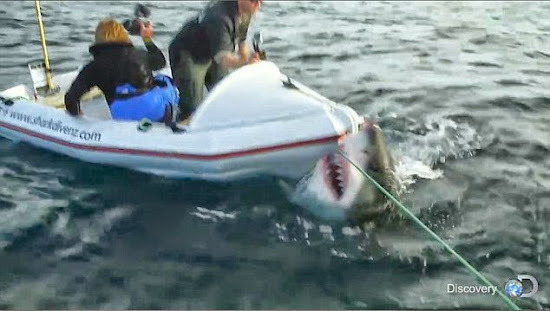 A film crew shooting the documentary Lair of the Megashark were just off New Zealand's Steward Island when they attempted to put a camera on the dorsal fin of the massive ocean predator who decided to nudge the boat and bite at the thin rope that tethered the dinghy to the main boat. The two men that can be seen on the boat are shark experts Jeff Kurr and Andy Casagrande. They can be seen panicking as the great white uses it's strong jaws and tail to shake the boat, causing it to sway dangerously. The shark disappears for a few moments while the crew regroups, however, they are stunned a second time when it resurfaces dangerously close to the dinghy, as it tries to get a hold of the bait attached to the main rig. One of the men described the experience as 'a bit nerve racking' while another man can be heard saying: 'I don't think this is such a brilliant f*****g idea you know'. Another shark is spotted breaching near the small boat before the crew decide it is too unsafe to have a boat of that size in the water, while such large predators are in the area. One man can be heard warnning that while sharks are 'not malicious', they do 'kill things for a living'. The documentary Lair of the Megashark was screened on the Discovery Channel last year during Shark Week. Images of the footage have been posted online by groups who want to ban shark diving as they think it's causing sharks to associate humans and boats with food. Fisherman Richard Squires told the New Zealand Herald he had faced two similar attacks and is confident that the reason sharks are becoming more comfortable around boats is cage-diving. 'A shark came up and bit a buoy on the stern of the vessel, it came charging out of the water with its mouth open,' he said. Last year the Department of Conservation only granted permits to two cage diving operators under the condition that they observe strict regulations around feeding and using decoys. They are also only authorised to operate at Edwards Island, around 10 kilometers off the coast of New Zealand's Steward Island. New Zealand MP Clayton Mitchell is calling for the activity to be prohibited until a comprehensive study into the impact of cage diving is completed. 'When you start bringing the sharks in close to your boat for the thrill-seekers, like any animal their behaviour becomes modified,' he said in a public meeting about the shark problem. Experts, on the other hand, are certain cage diving has nothing to do with the increased great white activity. The Department of Conservation's director of conservation services, Allan Munn, said it is 'highly unlikely' shark diving would change the behaviour of sharks in the area.